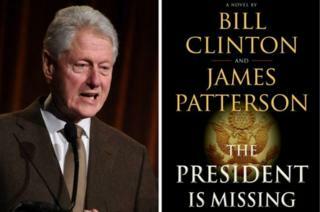 Former-president Bill Clinton is writing a novel about the White House, publishers announced on Monday. The President Is Missing is being written in collaboration with James Patterson, believed to be the world's best-selling living author. The publishers say the book will be "informed by details that only a President can know". The book, which is Mr Clinton's first novel, will be released by Alfred A Knopf and Hachette in June 2018. "Working on a book about a sitting president - drawing on what I know about the job, life in the White House, and the way Washington works - has been a lot of fun," said the former president. "And working with Jim has been terrific. I've been a fan of his for a very long time," he added. The details of the plot are not currently known, but the two men have announced plans to hold a national book tour to promote it. Mr Patterson is considered to be the world's best-selling novelist in recent years, and has published more than 130 titles in his name. Mr Clinton has written several books since leaving the presidency, but never a novel. His other works include My Life, Giving, and Back to Work.